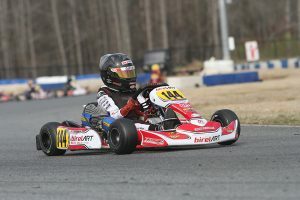 The third round of the WKA Manufacturers Cup Series program completed Saturday at the GoPro Motorplex in Mooresville, North Carolina. The premier facility of North America welcomed the competitors in the eight categories for the series to the first of two rounds of racing of the BBS Nationals, with sunny skies greeting the racers all day. The action was exciting throughout the day, keeping the fence line packed with spectators to see what would unfold through the two heat races and main events for each class. For many years, the combination of Brandon Lemke and Merlin won at WKA events, including a Triple Crown season during his Cadet years. Lemke helped to put Franklin Motorsports / Merlin back on top of the podium with a victory, sweeping the action on the day. Lemke set fast time in qualifying and won both heat races. 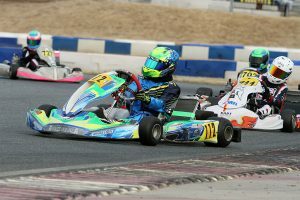 The 18-lap Final saw four drivers break away with Lemke leading Senior rookie Tahlon Yockel (Kosmic), Brandon Jarsocrak (KSNA / Kart Republic) and Jake Venberg (Franklin / Kosmic). They ran static until two laps to go when Venberg went for it from fourth, and made contact with Jarsocrak. That took both out of the running and Yockel did not have enough for Lemke, as the Wisconsin driver scored the victory. Austin Schaff (Franklin / Merlin) moved up to third with Chase Dow (Birel ART) and Pauly Massimino (KSNA / Kart Republic) completing the top-five. The KA100 Senior division looked to welcome a new winner to WKA with Brooke Nachtmann (Tony Kart) showing the way throughout the day. She set fast time in qualifying and won both heat races comfortable with Dakota Pesek (Top Kart) earning the outside row one starting spot. The start of the Final saw Pesek take the escape route at the opening corner and jump out to the lead with Nachtmann dropping to third. She moved up to second and went after Pesek for the lead on lap three. Contact was made and Brooke went off into the wall at the hairpin. Pesek continued but back behind the top-five. This gave Emory Lyda (Nitro Kart) the lead with Byron Daley (Fullerton) and Arie Venberg (Franklin / Kosmic) trailing. 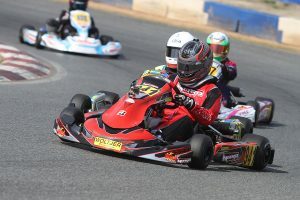 All three took a turn at the point, but it was Lyda that secured the position and held on for the victory, his first in the category and first for the full-size Nitro Kart chassis. Venberg was able to finish second with Daley in third. Winston Workman (Top Kart) ended up fourth with Pesek fifth. He would be penalized for the incident involving Nachtmann, yet was the driver in front. That promoted Nate Dean (Top Kart) to fifth in the final standings. Thus far in WKA competition, Connor Zilisch is 5 for 6 in Finals, winning both the IAME Junior and KA100 Junior main events on the day. Zilisch won all the races in IAME Junior, missing out on fast time qualifying as Isaac Beekman (Kosmic) was quick driver. Zilisch, after winning both heat races, led wire-to-wire in the main event, earning the victory by one-second over fellow Junior rookie Brent Crews (KSNA / Kart Republic) – celebrating his birthday. Junior rookies completed the podium with Paige Crawford (Tony Kart) trailing the top two for much of the race to earn podium in her first Junior start in WKA competition. Connor Ferris (TFR / Kart Republic) was fofurth with Hayden Jones (Nitro Kart) winning the fight for fifth. Zilisch grabbed his second victory of the season in the KA100 Junior class on the day. Zilisch won Heat #2 and used that momentum to lead wire-to-wire in the main event. Tyler Wettengel (FA Kart) won the battle for second ahead of top qualifier Chloe Chambers (MDR / Kosmic). Dylan Christie (MDR / Kosmic) was fourth with Heat #1 winner Brent Crews (KSNA / Kart Republic) fifth. Another marquee win came in Mini Swift with Caleb Gafrarar (Birel ART) earning his first in the category. The 2017 Micro champion made his first Mini start with WKA today, setting fast time in qualifying and winning Heat #2. Adam Brickley (Nitro Kart) jumped out to the lead in the Final with Gafrarar trailing. Eventually, Gafrarar jumped ahead for the lead, and then held off Brickley at the line by 41 thousandths to claim the victory. Heat #1 winner Cameron Weinberg (Nitro Kart) completed the podium with Julian DaCosta (Haase) fourth and Miles Murray (Nitro Kart) fifth. Spencer Conrad (Nitro Kart) earned his second victory of the 2019 season in the Micro Swift division. After sitting fourth in qualifying, Conrad won both heat races and led wire-to-wire in the main event for the victory. Hoyt Mohr (Nitro Kart) made a late charge with fast laps of the race, coming up short. Ayden Patty made it a Nitro Kart 1-2-3 on the podium with Levi Copass (Benik) up from 10th to fourth and Carson Weinberg (Nitro Kart) in fifth. Aryton Grim gave Nitro Kart three wins on the day, winning the drag race to the checkered flag. 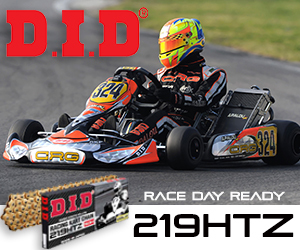 Conrad started on the pole position in the main event and led a four driver pack including Danny Dyszelski (Nitro Kart), Christopher McKeithan (Nitro Kart) and Spencer Conrad (Nitro Kart). Grim was able to work his way from third to first in the final two laps, edging out Conrad at the line for the victory by 28 thousandths of a second. McKeithan gave Grim a great push, ending up third with Dyszelski fourth. Andrew Brallier (Nitro Kart) completed the top-five. 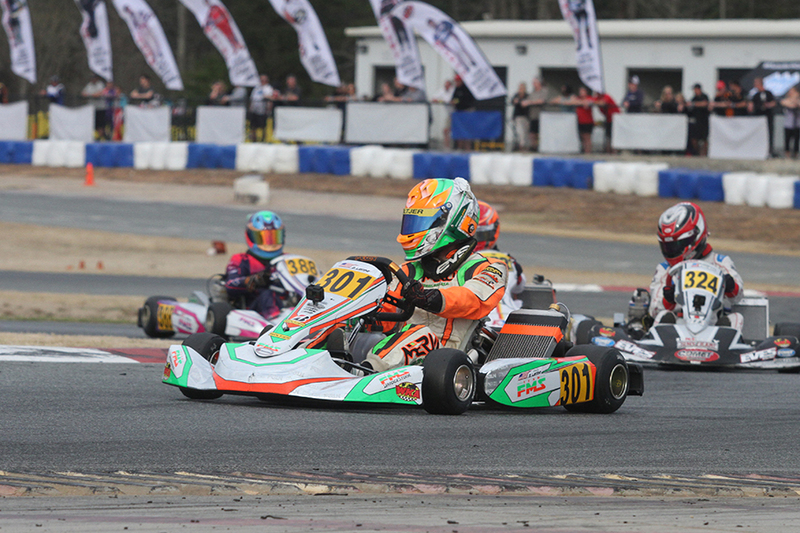 Max Cristea (Top Kart) became the third different winner in the Kid Kart division on the season. Cristea had a flawless main event, winning by over 10 seconds ahead of Holden Harder (Emmick) with Colton McQuade (Top Kart) slipping into third ahead of Jacob Schaible (Emmick) and AJ Stoner (TB Kart).